Mission: serve up yummy grub in the Great Outdoors. What's cooking? Expand your options with this lightweight, super-compact cooking and serving solution. 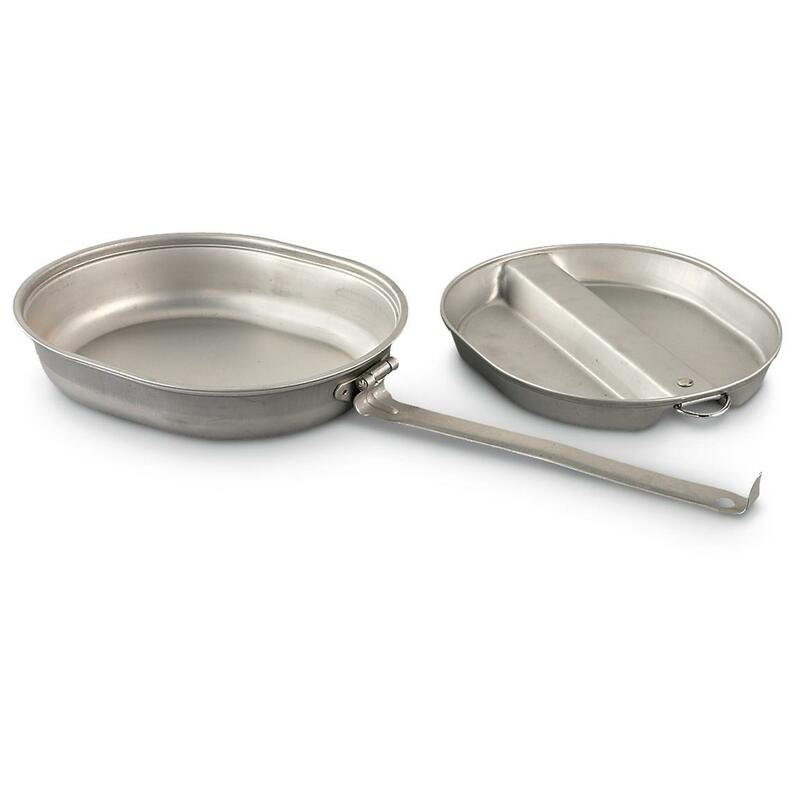 Each nested Kit includes 2 trays, one with a long handle for easy heating. Built to strict U.S. Military specs! Boonie meals take on a hot new direction! Dimensions: 8‌.5" x 7‌.75" x 2.75”h. 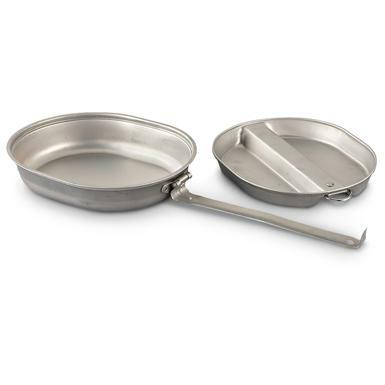 U.S. Military Surplus Stainless Mess Kit, Used is rated 4.2 out of 5 by 27. Rated 5 out of 5 by Hawkeye from Very nice piece of kit. This is the best price I've found on these stainless steel mess kits. The ones I got are a little thinner than the older one I used to have, but I do like the lighter weight. They arrived in surprisingly good condition. Rated 5 out of 5 by Rick from Great condition, looks new. Hard to find in this condition. Reminds me of the good old days. We, "US Army" used these exact same field mess kits when we were lucky enough to have a mess hall close enough to us for chow. Rarely used them for our Cs but could have. Rated 1 out of 5 by Pokey from The kit looked like it had been stomped on by a rather large person totally unusable.Customer service is sending a return label so I can exchange it, but there is no excuse for sending a piece with such obvious damage in the first place. Rated 5 out of 5 by Larry from US Mess Kit a classic The mess kit I received was in great shape and dated 1966. A nice piece of functioning history. Rated 5 out of 5 by Ben9804 from Awesome find. Ordered two. One was 1980's era in perfect condition. The second was an unexpected jewel dated 1945. It was a little warped but what do u expect for a 71 year old collectors item! Rated 5 out of 5 by Toad from Good value.......... Thank you.